When you think of Vermouth, you don’t necessarily think of classic cocktails mixed with modern branding and artisanal production. You probably think of your gran and her cheap bottle of Martini Rosso from the corner shop. Not for much longer though. What were once considered OAP beverages are now making their way into the top bars. There are, in fact, designated vermouth bars in Spain and there has been sufficient chatter on the London bar scene to suggest that vermouth is playing a greater part in our cocktails once again – after all, the original martini cocktail was 50/50 gin and vermouth, not the much stronger version we have become accustomed to. But why is vermouth the talk of the town in 2015? Well, partly because in an alcohol market that has become saturated with small-batch distilleries and bigger brands, vermouth remains a relatively untouched category, giving it potential for genuine growth. The men behind Belsazar Vermouth saw this gap in the market and have capitalised on it. This young German vermouth brand, which is trying something new and exciting, didn’t have the easiest start, with many wineries shying away from what they considered to be a bad venture. Usually red vermouth is made from white grapes and is then coloured red. Belsazar makes their red vermouth from red wine and their rosé from rosé. This might seem obvious but it is actually rather revolutionary, and it adds a wonderful extra depth and dimension to their range. Their red vermouth has a rich, spicy quality that makes for the most exquisite Negronis and their rosé is delicate and floral, mixing fabulously with gin to make a martini cocktail. A ‘proper’ martini cocktail. In the majority of vermouths, the wine is entirely masked by oxidation or smothered by sweetness. Luckily, though, family winery Zähringer saw the potential of Belsazar and appreciated their desire to not mask the base wines. 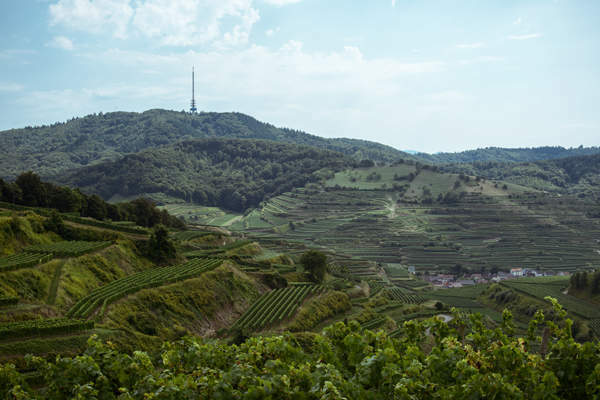 All of the wines used are bio-dynamically produced on rolling hillsides in the Rhine valley (below), just before the hills of the Black Forest start to turn into more significant peaks. Tucked below the vineyards is the Schladerer distillery, another family-owned business who are trying something new with Belsazar. On the day I arrived to look around the building, there were three generations of the family all tending the central garden courtyard. 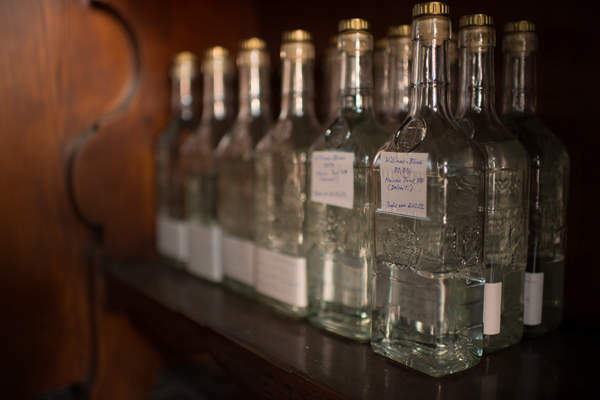 They have been running the business and producing fruit brandy since 1844, so it was quite the undertaking to start producing vermouth on the side. They have managed, though, partly due to the good friendship between Philipp Schladerer and Max Wagner, co-founder of Belsazar, and despite a few teething problems with labelling machines and so on, they are increasing production to meet increasing demand. As we leave the distillery and head towards our hotel for the night, and more importantly our dinner accompanied by various different Belsazar cocktails, we drive through chocolate-box towns and vibrant green countryside. It is a picturesque setting, particularly when the summer starts to take hold and temperatures regularly hit the high thirties. It is not what you imagine when you think of vermouth, or Germany for that matter. This, though, is the joy of Belsazar: it is making vermouth into something unexpected. It combines great German wine with fantastic fruit brandy and mixes those with interesting botanical macerates, wine must and some imaginative thinking. Vermouth has a much lower alcohol by volume than spirits, so it makes your cocktails more afternoon friendly (if you should be so inclined), and if you prefer drinking later, you can have a few more without falling over. 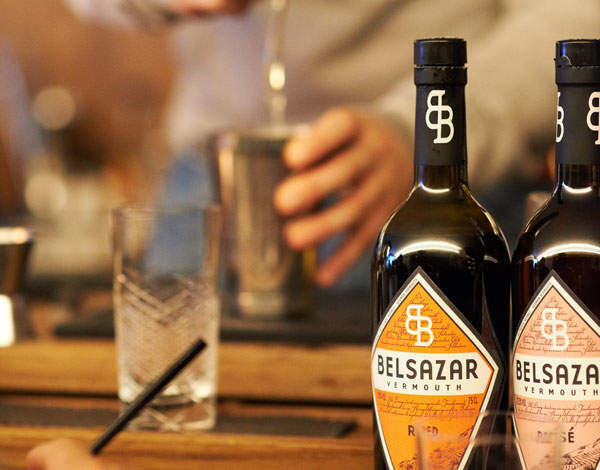 Belsazar launched a year ago (you’ll find that Alex Matchett went to taste their products shortly after the launch) and they are starting to see repeat orders coming their way – bartenders are swapping out their old vermouth brands for Belsazar and using more of it to boot. They are making the classics with proper quantities of vermouth, creating spritzers to rival the early evening Aperol and even serving Belsazar vermouth straight up. It must be encouraging for Philipp, Max and Sebastian, the trio behind the brand, who took a great leap of faith to produce this product. I predict that things will go from strength to strength for them – they have a wonderful product, which is doing something new in this market. 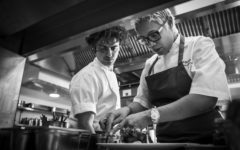 Beyond that, they have a wonderful, family-oriented ethos and a passion for doing things properly. I’m a huge fan already.